The first time I went for a run in Bogota it was along the Septima on a Ciclovia Sunday. 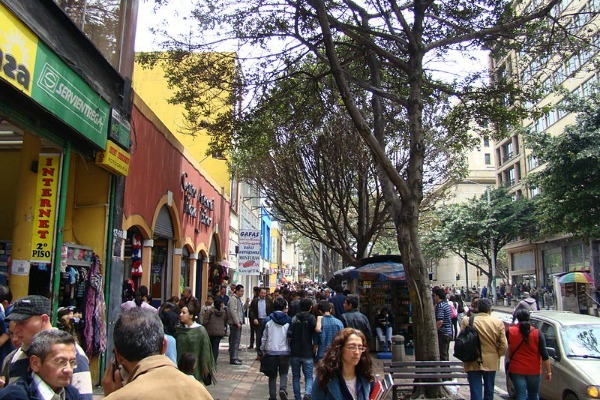 Now, the Septima is no ordinary street, it’s the vein of Bogota, linking the north to the south. And the blood that runs through the lively Septima is not just the people, but what they bring with them. Head along the Septima in the centre of town and you’ll find it’s a destination all on it’s own. There are people dancing and singing, there are painters showing off their prints on street corners, there are food vendors selling anything from sandwiches to fried ants, there is music on loud speakers, Vallenato, Salsa, Merengue. There are slackliners who’ve managed to find a suitable place in the busy street to tie their slackline to and begin to make a spectacle, encouraging people to gather round to see what all the fuss is about. There are buskers, good and bad, talented and not so talented, there are people selling goods in the street – handbags, movies, sunglasses, hand-beaded jewellery. There are people on bikes, families with strollers, there are gringos in comfortable clothing and walking shoes. There are teenagers and families, emo kids and business men eating ice-cream. All making their way around the city via the Septima. I stop and take in all the sights, the smells – the corn cooking, sweet bread baking, coffee, smoke, the exhaust fumes from the Transmilenios that speed down side streets, the smell of the oncoming bout of rain that lingers in the air. It seems the longer you’re in Bogota and the more you visit the Septima, the more you notice. Nice post Sarepa. ‘La Septima’ is perhaps the most emblematic and historically significant street in Bogota. It summarises all the good, the bad, the old, the new, the beautiful and the not-so-beautiful that can be found in this great city.